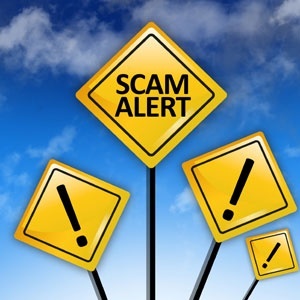 Johannesburg – A money scheme targeting black-listed consumers under the pretence of being Old Mutual is doing the rounds again. The scheme offers clients loans from R20 000 to R20m, at a fixed interest rate of 5%. There are no credit checks. You simply have to send details such as a name, ID number, phone number and monthly income. In an emailed response, Old Mutual group communications manager Ursula van Der Westhuizen told Fin24 that the bank was alerted about it last year. 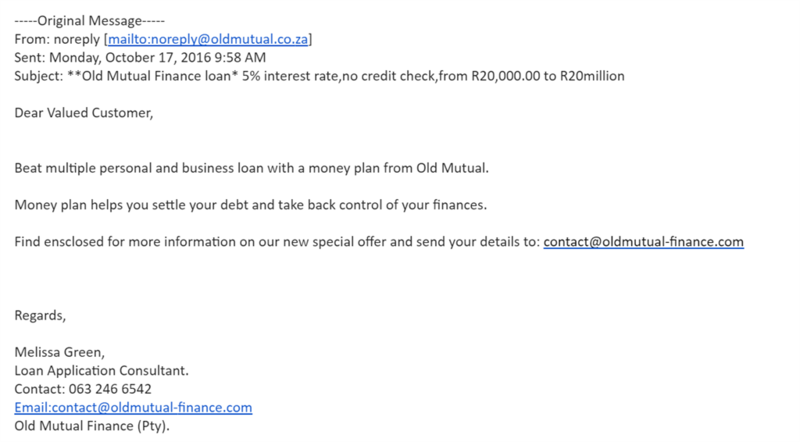 Old Mutual subsequently issued a statement on its website to warn the public about fraudsters using the company’s branding to offer loans and investment opportunities. Marshall said there has been no “reputational harm” to Old Mutual as a result of the scam. The financial institution has an active cyber-security awareness programme to alert customers and employees to scams of this nature in addition to getting email accounts closed, phone numbers blacklisted and websites shut down, he added. Old Mutual is unable to ascertain the exact number of people affected by this particular scam. “Consumers caught out by tricksters are often too embarrassed to come forward and admit it,” he said. On average, 10 cases per month have been reported for 2016. “There was an increase in reported incidents during September, and we predict that opportunistic scammers will be increasing their fraudulent activities in the next few months leading up to the festive season,” he said. The email which is being sent out to target consumers. Look out for suspicious or unexpected emails. Remember that online offers that look too good to be true, usually are. Be aware of how cybercriminals manipulate their victims. They may, for instance, impersonate someone or pretend to be from your bank. Never open an email you don’t trust. Never click on links in suspicious or unexpected emails from people you don’t know. Be suspicious of anybody asking for sensitive or personal information and never disclose this kind of information to strangers. Choose a strong password, change it regularly and don’t share it. Only insert removable devices like memory sticks and hard drives if you trust the source.